A neuroma is an enlargement of the surrounding sheath of a nerve. Though some people in the past have considered it a tumor, it is truly not a real tumor. It is merely an enlargement of the surrounding covering of a nerve. Foot neuromas themselves are totally benign. They are not a cancerous lesion. The most common neuroma in the foot is located between the third and fourth toes. 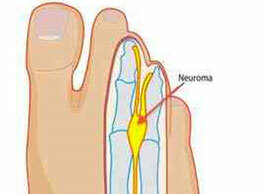 The most common symptoms of a neuroma include pain and burning - generally experienced on the bottom of the foot. People with neuromas often state that the pain can be either intermittent or constant. Sometimes when the pain becomes greater, people feel that the pain can cause them to be nauseous. There is often a burning and tingling sensation in the foot that extends toward the inner sides of the third and fourth toes as well as numbness in this region. Often times spreading and splaying of the third and fourth toes can occur and you may see what we call a peace sign between the third and fourth toes. In rare occasions the enlargement actually becomes palpable. Evaluation of a patient witha neuroma would involve radiographic evaluation in order to rule out possibilities of other growths as well as to rule out the possibility of a stress fracture in this area that can often occur and mimic similar symptoms. More definitive professional care would require possible use of an injection, such as Cortisone or sclerosing agents. Custom made orthotics may be required. In cases of chronic pain when conservative care fails, then surgical intervention may be needed for resolution of this particular problem. Surgery involves removal of a portion of the nerve that is involved with the enlargement. Generally this is conducted through an incision on the top of the foot. It can usually be performed on an outpatient basis.